Geronimo Stiltonoot and The Stone Gazette are in the running for the Stone Age Ratitzer: the award for the best prehistoric journalism. But their main competition is Sally Rockmousen, the ruthless host of Gossip Radio and she will stop at nothing to win. Can Geronimo sniff out a scoop in time to defeat her. Rating: 9.5 Creepella Von Cacklefur #6: Ride For Your Life! Rating: 9.6 Geronimo Stilton Cavemice #3 - Help, I&apos;m in Hot Lava! 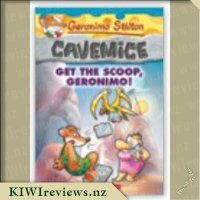 It&apos;s been a while since we&apos;ve read any books from the Cavemice series so we were super excited to receive the latest book for review. The books are a spin off from the original Geronimo Stilton series and focus on one of his ancestors, Geronimo Stiltonoot. 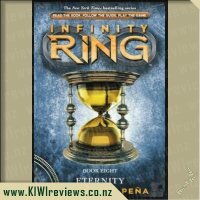 The series as a whole is very reminiscent of the Flinstones and each book can be read as a stand alone. In this book Geronimo Stiltonoot is on the hunt for the next big thing in order to win the Stone Age Ratitzer award. 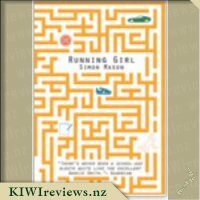 What ensues is a race against the clock to beat his rival, Sally Rockmousen and her very different brand of journalism so that the Rodent&apos;s Gazette can claim the award. The story lacked a little in excitement and adventure but still held my son&apos;s attention with the force of the character&apos;s individual personalities. Geronimo is his usual scaredy cat self and there is plenty of slapstick humour which when you add a sneezing dinosaur to the mix, provides a lot of entertainment. 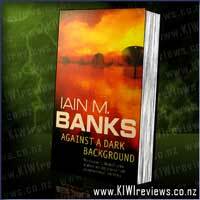 The chapters are a good length and we read the whole book over a couple of nights. Each page is bright and colourful with illustrations and different text sizes and fonts so there is always something interesting to look at. We really enjoyed this book despite it&apos;s slower pacing and we can&apos;t wait to see what Geronimo Stiltonoot&apos;s next big adventure will bring. Another Cavemice adventure came our way recently in our review pile. Geronimo Stiltonoot is an ancestor of G Stilton&apos;s. Miss 8 has taken a great shine to him, mainly because she likes the idea of being a paleontologist amongst other career pursuits. 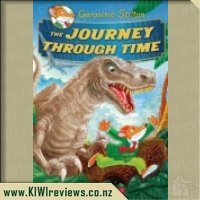 While the dinosaurs and stone age described by Stiltonoot is more akin to the Flintstones cartoon than real life, this hasn&apos;t dulled her enthusiasm for the books. In this adventure, Geronimo, Thea and Hercule are racing against the clock to get a big news story worthy of an award. The two contenders for the award are Geronimo&apos;s team and Sally Rockmousen who is the ancestor of Sally Ratmousen in the present time Mouse City. Naturally a few big news items come their way, and more than a few times we thought that Geronimo and co had Sally licked, but the story kept us on our toes. In reality, it was a terribly unfair competition. Stone tablet versus radio. While you could argue they are both mediums for journalism, it was hard to see how Sally was scooping them with her announcements, or why she was even a contender. Yet, sometimes it is best just to sit back and suspend your disbelief. The threat was real enough to the characters and my daughters listened intently to see what would happen next. As always there is some classic Stilton slapstick, including the breaking of tablets and some very dangerous sneezes. Miss 3 liked the story okay and thought the pictures were excellent, but there wasn&apos;t enough mystery clues for her in this one. She really likes the ones that encourage you to find or follow the clues. Miss 8 loved the Auto-saurus and thought that she would love to travel by dinosaur. We also had a chance to see different career options and new village characters in the course of the story, which I liked too. 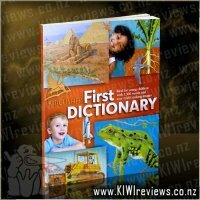 The perfect first dictionary for inquisitive children.